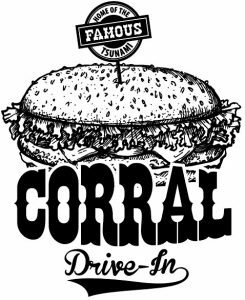 The Corral Drive In has been a Peninsula treasure for 30 years –and plans on being around another 30! This family owned and operated restaurant is reminiscent of those so many Gen-Xers and Baby Boomers enjoyed. You order at a window or counter. There’s some seating, but it’s more for waiting on your order than dining in. The burgers are warm – even the bun, with oozing cheese, crisp lettuce and tomato that actually tastes like tomato. The milkshakes taste like ice cream and come in more flavors than most would ever taste –though many try. 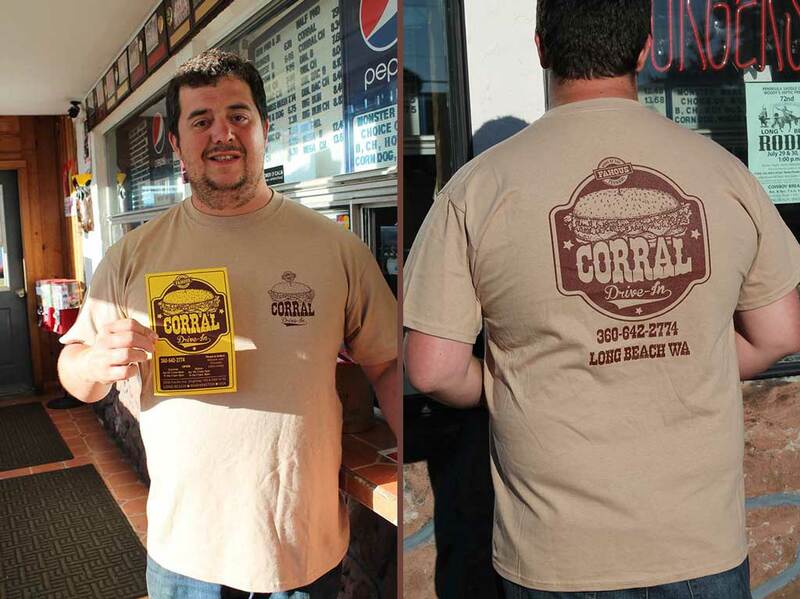 In addition to amazing burgers and shakes, the Corral is known far and wide for their (drumroll, please!) 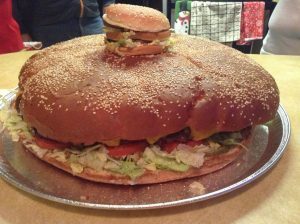 the one, the only, Tsunami Burger – a gastronomical feat the size of a large pizza. After 30 years in business, it was time for an updated look for the restaurant, starting with a new logo, menu, and t-shirt. We had a great time working with mother and son team Tina and Ray to come up with a logo that appealed to customers as well as local youth teams sponsored by the restaurant. It was important to Tina and Ray to create a logo the kids would feel good about wearing and represented the business clearly to customers. It needed to be modernized but retain the naturally –and intentionally– vintage feel of the business. We’re proud of the result. More importantly, Ray and Tina are excited to put it to work. Once the logo was finalized, we turned it into a menu. We printed several hundred professionally and provided files so Ray could print more on his own if he wanted to do so. Files were prepped for screen printing, and Tina took them to local, family-owned RipTideThreads to have shirts made. We always enjoy working with locally-owned, thriving, family businesses knowing they are the backbone of our community. We look forward to a long future of great service and food as Ray takes over the business, and are pleased to be a part of its promotion. Next A Kangaroo? In Long Beach? Previous Who says they don’t drink wine on the coast?